Though no one’s idea of a smash hit, 2011’s Horrible Bosses did enough box office to merit a sequel. With that, we find 2014’s uncreatively titled Horrible Bosses 2. In the first film, pals Nick Hendricks (Jason Bateman), Kurt Buckman (Jason Sudeikis) and Dale Arbus (Charlie Day) tried to get out of problematic situations via the deaths of their employers. Though they failed, one of the bosses died anyway, another ended up in prison and the other stopped ruining Dale’s life. As we find the guys now, they’ve left their old jobs and founded their own business so they can manufacture a time-saving device called the “Shower Buddy”. They get a boost when a huge company run by Bert Hanson (Christoph Waltz) agrees to partner with them. Bert and son/co-conspirator Rex Hanson (Chris Pine) rip off the guys and swindle their business from them. Understandably, this leaves Nick, Kurt and Dale upset, so they plot their revenge: they’ll kidnap Rex and hold him for ransom. Wackiness ensues. Looseness usually acts as a positive when it comes to comedies, but that depends on how the looseness manifests itself. Looseness in attitude and performance tends to serve comedies well, but looseness in script/story structure can become a drawback. Of course, this doesn’t serve as a perfect rule, as I can find plenty of solid comedies that offer only the most rudimentary structural elements. Take 1980’s much-beloved Caddyshack, for example. While it offers plenty of laughs, it fails to provide a coherent story and ambles along any random path it chooses. As Caddyshack shows, that approach can succeed, but I still think a comedy with a tighter script/narrative seems more likely to prosper. In the case of Bosses 2, it provides both the good and bad forms of looseness. On the positive side, the actors seem to be relaxed and they approach their roles with a casual feel that allows them to deliver strong performances. In particular, the connection among the three leads brings spice to the proceedings. They show real comfort together, and the movie capitalizes on their interactions to give us a fair number of laughs. Bateman does deadpan disdain well, and the idiocy displayed by Day and Sudeikis keeps him busy. However, Bosses 2 tends to rely a little too much on this side of the story, especially since I get the feeling character IQs dropped about 30 points since the first movie. Dale and Kurt acted like dopes in the original flick as well, but Bosses 2 turns them into such morons that it stretches credulity too much of the time. No, I don’t expect realism from a movie like this, as both films give us absurd comedic farces. Nonetheless, the extremes to which it pushes the idiocy can be tough to swallow. Bosses 2 tends to make Dale and Kurt such cartoons that it becomes tough to accept them as engaging characters. The script’s looseness also turns into an issue, mainly because it feels like comedy drives narrative and not the reverse. A better-made movie would produce laughs out of situations that suit the story, but Bosses 2 puts the cart before the horse. It appears as though the writers came up with comedic scenarios and crammed them into the plot without much concern for logic and suitability. This means we still get laughs, but they don’t come anchored by a compelling tale. Bosses 2 forces us into a boatload of contrived circumstances and never makes them especially involving. Like I said, these exist as excuses for comedic shenanigans, so any attachment to story/character development becomes incidental. Even with those drawbacks, Bosses 2 remains an entertaining movie. More than other genres, I think comedy relies on performances, and with a talented cast, Bosses 2 musters enough amusement to keep the viewer with it. I just would’ve preferred a film that worked harder to ground the hilarity in a compelling story. 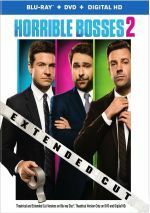 Horrible Bosses 2 appears in an aspect ratio of approximately 2.40:1 on this Blu-Ray Disc. Though not a bad image, the movie provided inconsistent visuals. Sharpness became the most obvious concern. Throughout the movie, the picture showed generally positive delineation, but more than a few shots could come across as a bit soft. These instances didn’t seem egregious, but they meant the film lacked terrific delineation. No issues with jagged edges or moiré effects occurred, and edge haloes failed to appear. Source flaws also remained absent, though the picture could appear slightly noisy at times. Colors looked good. The image took on a slightly golden tone much of the time, but the image stayed with a pretty natural impression. The hues seemed vivid and full. Blacks appeared dark and tight, but shadows could seem a little murky. Overall, the movie usually offered pretty nice visuals, but it lacked the precision I expect from Blu-ray. I thought the DTS-HD MA 5.1 soundtrack of Bosses 2 was unexceptional, though it worked fine for this sort of film. Of course, I didn’t expect a dazzling soundfield from this sort of comedy, and I got exactly what I anticipated. In terms of effects, general ambience ruled the day. Surround usage stayed limited; the back speakers gently fleshed out various settings but did little more than that. In those forward channels, the music provided nice stereo separation and opened up the mix reasonably well. A few of the more action-oriented scenes – like a car chase – managed to spread out the spectrum a bit, and bar sequences used the speakers to demonstrate a slightly more active sense of place. This remained a pretty standard comedy track, though. Audio quality appeared fine. Dialogue was consistently warm and natural, without edginess or problems. Effects seemed appropriately clear and accurate, with good range and punch. The music worked quite well, as the score and songs were pretty peppy and warm. Nothing here really impressed, but it all sounded good enough for a “B-“. The package includes both the film’s theatrical cut (1:48:26) and an extended version (1:55:49). If you saw the elongated edition of the first film, you’ll know what to expect here. That means no genuinely new sequences. The extended cut never pads its length with unique narrative material; instead, it simply expands scenes that also appear in the theatrical version. So viewers should anticipate bunches of sequences with added lines. I stopped counting after a while, but I found at least 15 segments that brought in new quips and comments. Some work better than others, but most amuse. I don’t think the extended cut provides the superior version of the film, particularly because the movie’s length drags a bit; 116 minutes might be a bit long for a flick of this sort. Still, the extra jokes can be good, so fans will enjoy the option to hear them. A bunch of featurettes follow. The most substantial, Endless Laughter Guaranteed! runs 17 minutes, 28 seconds and includes comments from writer/director Sean Anders, producers Chris Bender and John Rickard, writer/producer John Morris, and actors Charlie Day, Jason Bateman, Jason Sudeikis, Jamie Foxx, Chris Pine, Christoph Waltz, and Jennifer Aniston. The show looks at cast and performances. The information presented tends toward praise, but we get lots of alternate takes, so those make it worth a look. The remaining featurettes offer brief pieces. We find Let the Sexual Healing Begin (2:24). Who Invented the Shower Buddy? (1:29), Nick Kurt Dales INC: Employee Testimonials (2:13), It’s the Shower Buddy – Infomercial (1:10), and High Speed Crash Course (2:47). Except for “Course”, these give us little in-character clips that mix exclusive footage with some movie clips and outtakes. They’re generally amusing. As for “Course”, it includes comments from Anders, Bateman, Foxx, Sudeikis and Day. The featurette examines a car chase scene, mostly from the actors’ POV. It lacks much substance. Under Off the Cuff: One-Liners You Didn’t See, we get 13 clips with unused footage. These fill a total of 18 minutes, 19 seconds with alternate takes and some bloopers. The goofs/giggles don’t fill a ton of time, so instead, you’ll see plenty of unused jokes. Those make this a fun collection. The disc opens with ads for Get Hard and San Andreas. No trailer for Bosses 2 appears here. A second disc brings us a DVD copy of Bosses 2. It includes “Endless Laughter Guaranteed!” but lacks the other extras. The DVD also presents only the theatrical version of the movie. Though inconsistent, Horrible Bosses 2 manages reasonable amusement. The chemistry of its actors carries the movie through a bunch of potential pitfalls. The Blu-ray comes with fairly good audio but delivers somewhat lackluster picture and supplements. While not a great film, fans of the original should enjoy Bosses 2.